Happy April! I’m pleased to be contributing to the challenge this month with my talented friends. My own theme this spring is music from my collection and I nearly used Bile (as in the band) for my post here. Somehow, though, that name seemed just a little, well… gross. So I decided to blog about blogging. The art is not something at which I’m particularly prolific or gifted but have certainly met some wonderful people around the world. Additionally, it never ceases to impress me when folks manage to make money with the creative endeavor. Several bloggers I’ve come to follow, especially in the nation of India, receive trips in return for product reviews. My favorite had to be an overnight visit cross country where my blogging friend got to tour an industrial plant. The writers all feasted on wonderful sounding foods and enjoyed the company of their peers. And they took home goodies! Swag, I tell you! It made me jealous until I remembered how introverted I am. Hence blogging gives me the perfect opportunity to reach out to the world from the comfort of my own home. What about you? Do you blog? Does it earn you benefits outside the creativeness? Please let us know in the comments so I can turn green with envy. 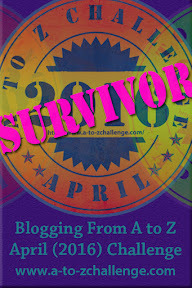 This entry was posted in Blog and tagged #atozchallenge, Blogging, Darla, Writing. Bookmark the permalink. Grace, you are a very gifted person. Please do not doubt this. And you’re very kind, but I’m not the most consistent blogger. This challenge was blessedly introduced to me by our own beloved A. Catherine Noon and fostered by the event itself. You can do it! But please don’t spare time in sake of writing your stories, which I hope to read someday. Best wishes!